I went to a Michael’s Craft Store. It’s scary enough in its own right this time of year, but not as bad as the mall. Then, they (we) all stand in long lines to use the day’s special-bonus coupon to bring the cost to a manageable price. I was one of these shoppers. A couple of weeks ago my daughter found some cool holiday glasses in front of the tree display. These glasses look like the 3D-movie glasses we wore when I was a kid — paper frames with a thin piece of plastic for lenses. But instead of red and blue 3D-lenses, these glasses have tiny laser etchings on them that turn points of light into simple little pictures. They work awesomely with Christmas lights (which is probably why they were next to the trees). Put the glasses on and suddenly your holiday tree is covered in glowing snowmen … or gingerbread men … or candy canes! It’s awesome. These will probably make fun stocking stuffers or small gifts for those who might appreciate altering their reality with a simple pair of glasses. I’m hoping we can go to a festival-of-light display and mix it up a little with some Frosty glasses. After thinking the store was out of these Laser Glasses, I found a new stash of them behind the Christmas tree display. Yay! My kiddo will be happy (and I like them too)! I kept finding new and interesting things around the store. I was standing in one aisle trying to move past another shopper when a young child behind me said, “look, a poo pillow!” He sounded so innocent and cheerful. 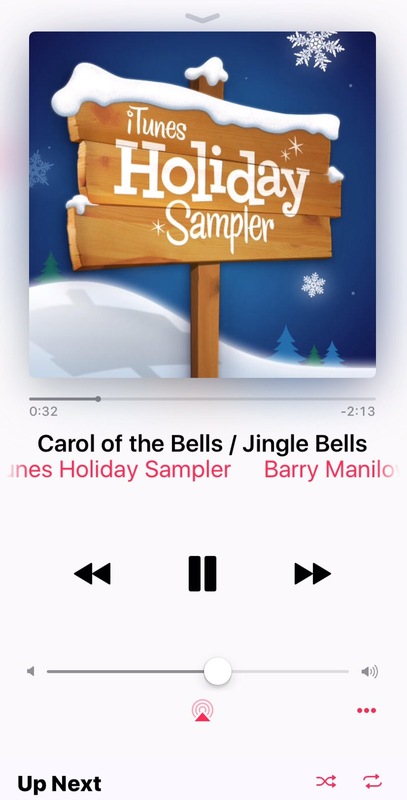 I was sure I couldn’t possibly have heard him right (sometimes I am a little hard of hearing). So I turned around to find that, indeed, there was a pillow that looked like poo. The entire bin was filled with emoji-inspired pillows, and one of them looked like brown poop with a happy face. (Because that’s exactly what everybody wants for Christmas, right? A good bowel movement? Did I just go there?) It can sit right next to the angry emoji pillow. I think they look nice together. Or maybe not. You can also get purple poo (maybe in case you’ve been eating too many garden huckleberries). Apparently, I am so not up on my emojis. I think I’d be happy with a smilie face or the pillow with glasses. I’m probably not very cool that way. 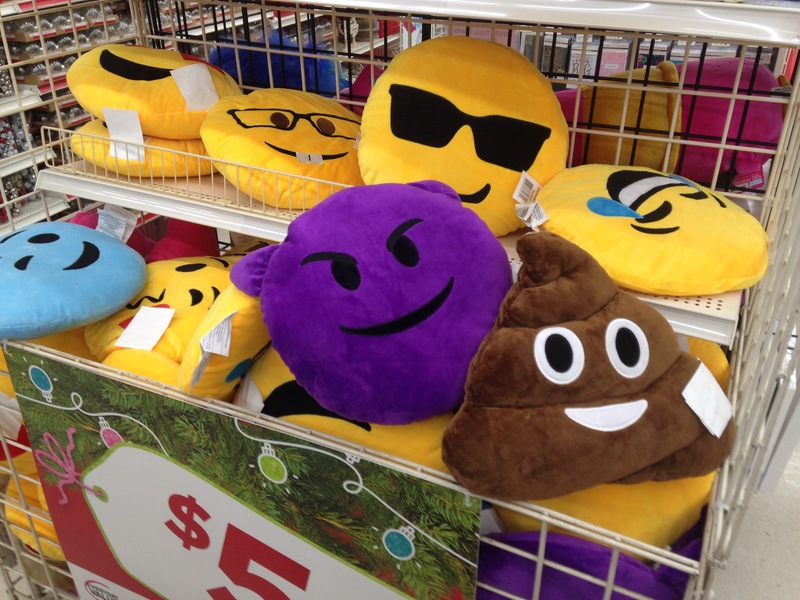 Emoji pillows, including a poo pillow. 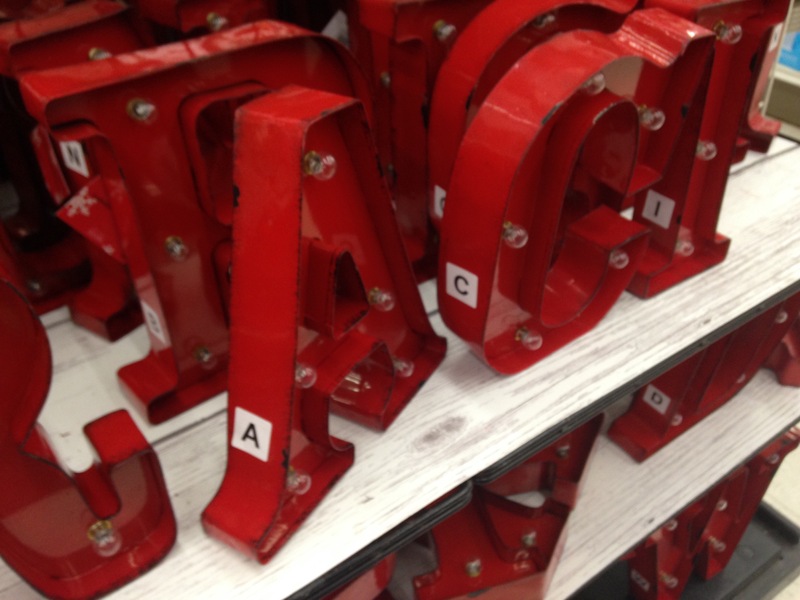 Later, I found marquee letters on sale. Marquee letters. I should have set them up to spell something fun before I snapped the photo. Oh wait! It does kind of spell something. 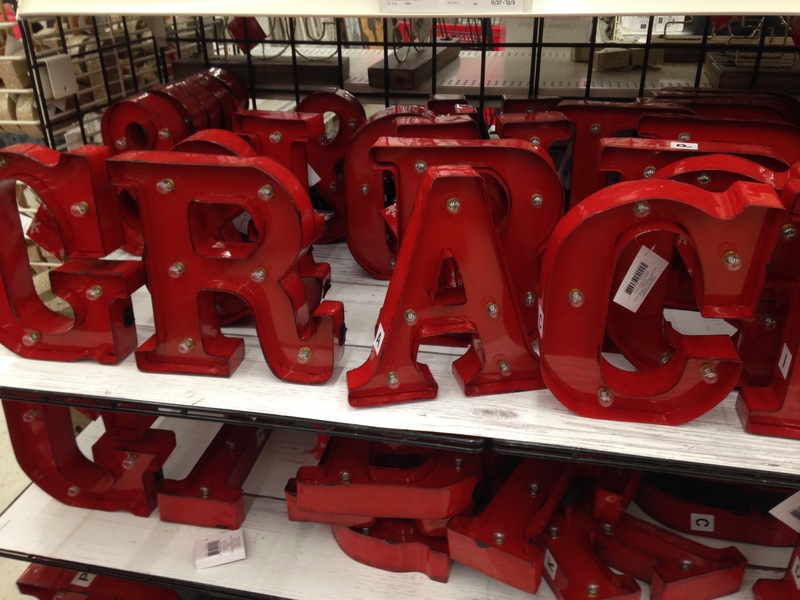 It’s almost “grace.” But then the last letter is really an “i,” so it’s “graci.” which is kind of a word too. I guess the stickers would be helpful if the letters were stored on a shelf so that only the side shows. I keep changing the title of this post because I wasn’t crazy about the first two titles. Plus I just wanted to experiment. So if you feel like you read this post before, then maybe you did. I’ll probably stick with “I [Emoji] Holiday Shopping,” for now. (Because in my mind I can put any emoji there based on my particular mood regarding holiday shopping. It varies. Some days the pillow emojis shown (above) describe it perfectly. Also, my daughter saw my photo of the emoji pillows and said, “wow, emoji pillows for only $5 !” I guess she thought it was a good price. She also confirmed that the brown pillow is supposed to be poo. I’m kind of wondering if I should be blogging about poo pillows. And, really, I kind of wonder why they make poo pillows. And why they have poo emojis in the first place. I wasn’t crazy about either major-part candidate, and it has been one really weird election year. More than ever, I feel like I’m in bizzaro world. The Spock with a goatee will walk in at any moment. I claimed I wouldn’t be surprised either way, but I think I am actually surprised. I hope every registered voter who reads this, voted. I’m going to pray and hope that we can all find good in this going forward. I think there can be good. This was my post for NaBloPoMo Crazy Day 9. Well, well, well. It actually happened! The “curse” is broken. All good and bad things come to an end. It is reassuring in its own way. Like maybe I’ll conquer Mt. Laundry someday for real. Or write a novel for NaNoWriMo. I like sports from time to time. 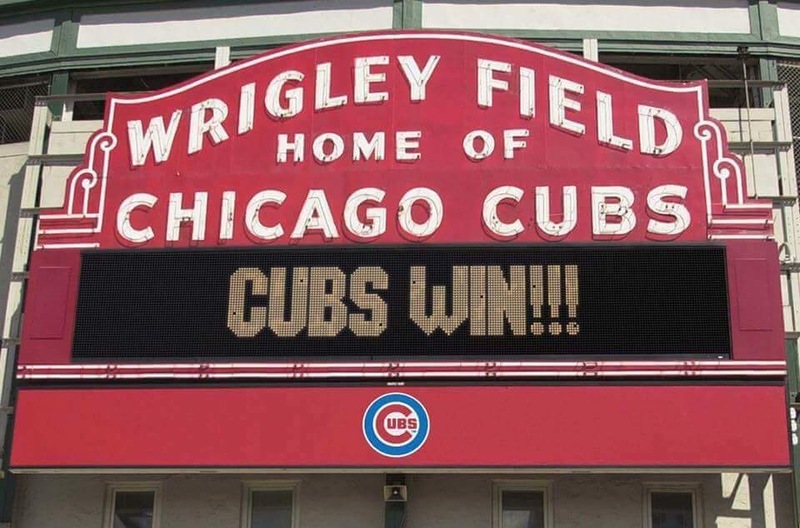 And since I’m originally from Chicago, there’s Cubs fan fiber deeply embedded in my being. It’s great to see my Chicago family and other Cubs fans so elated (while also seeing them stress a lot leading up to the win). Thank you Facebook for letting me share in some of their joy. (Did I just THANK Facebook? Gah.) Thank you, family, for sharing your crazy-happy moment. 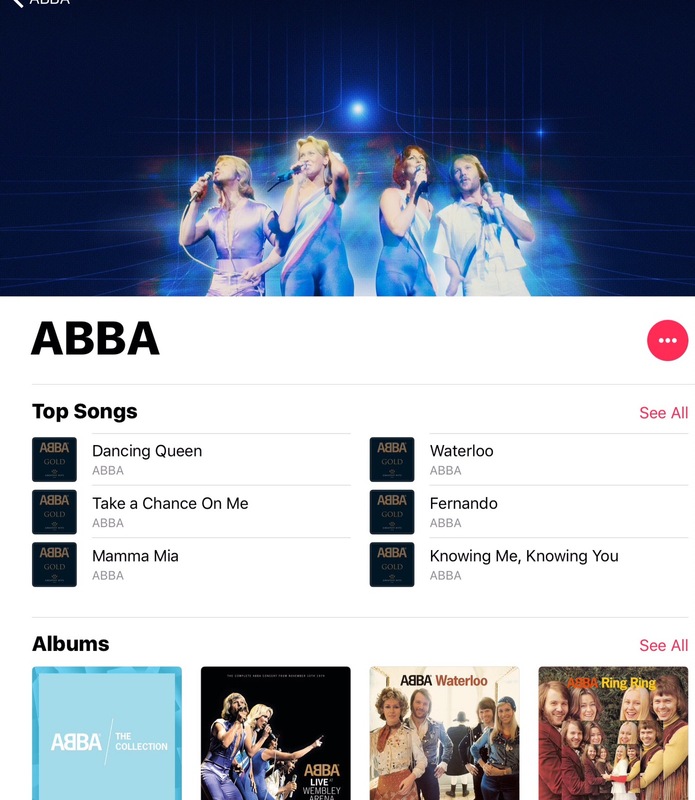 And, hey, this was a blog post for NaBloPoMo Day 3. *Non-winning streaks for major American sports teams anyway. I’m sure there’s some official designation, but I probably don’t know sports well enough to word this right. I heard the word drought used for this on the radio, and I thought it sounded good. Following up to add that Neil deGrasse Tyson, posted several facts to give a better idea of how long it’s been. It’s a fun way to put it into perspective. Halley’s Comet has appeared twice since the last time the Cubs won a Workd Series. Mark Twain was still alive. The cosmic object Pluto, formerly known as a planet, hadn’t even been discovered yet. Ford’s Model-T cars had only just started rolling off the assembly lines. So just imagine what the streets looked like in 1908. Wow! by alightningbug in Getting Organized, Mom Stuff, Uncategorized and beyond. My long weekend! My month of May! Where did they go? I have less than a day of May left, and the weekend is completely gone. But at least it was a nice weekend, and I can’t say that May was bad either. It’s just that I would like more of both. My laundry status is at the ever-so-nice place where closets and drawers are chock full ‘o the clean stuff. And the hampers have mostly empty bellies just waiting for us to feed them all week long. I even managed to swap out some summer clothing and put away winter clothing. Yay. My daughter had a ball drawing all kinds of things with sidewalk chalk–bees, giant ants, snakes, rivers, pants, cars and even bottomless pits. But at one point she got a little too enthusiastic and geeky. I love her pastel rendition of “stick people family.” But, later, she moved her work vertically, writing, “The cake is a lie,” on the outside wall of our home! D’oh! She even included tally marks which makes her quite thorough and it was fun and funny of her, but still D’OH. Luckily it was wash off chalk, so away it went. The stick family stayed though. I finally finished Portal. Portal 2 that is. Found a few bugs along the way. But I managed to finish it just a few short minutes after my awesome daughter finished. Daddy helped her a bit, but really, she did an amazing job on her own! Speedy thing! Well, speedy at games. She takes longer on other things. Like the bathroom. She takes a reeeally long time in the bathroom. So I kind of win on that! Woo. But I’m happy to have finished Portal2 because I like playing Portal and the fact that I finished means I was able to be playing and so was my daughter. On the flip side, however, now that I finished playing it, I no longer have finishing it to look forward to. Kind of a catch 22. But I still have some achievements to earn, so there’s that AND Portal 2 has co-op and I only finished single player, so there’s lots more to look forward to! I’ll feel much less guilty about playing, however, when I get more laundry done as well as general clean up and organizing. I did manage to get some laundry done, go through some papers, file them in the garbage can, and affix about 15 patches to my daughter’s Brownie vest today. So at least I did something besides playing Portal 2. But here it is Sunday night. Tomorrow is Monday. (Always happens in that order, doesn’t it?) And, once again, I didn’t get as much done this weekend as I’d planned. Here we are again. I wish the dirty laundry would be GONE.